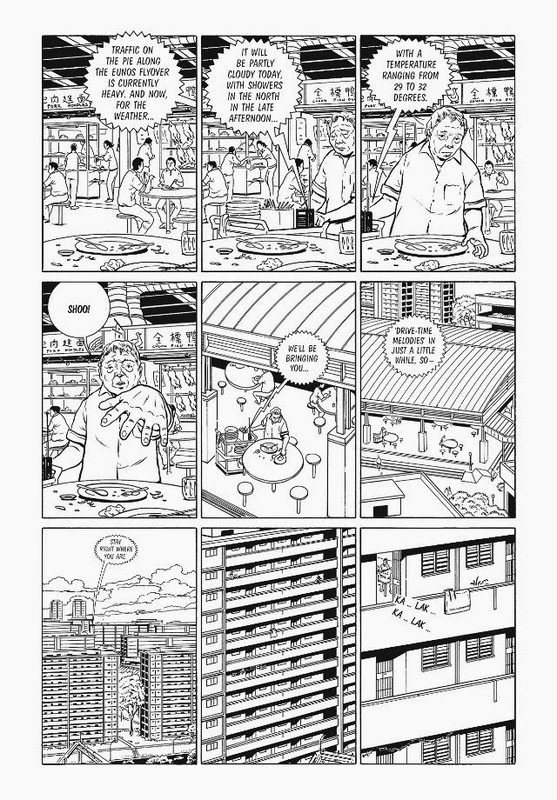 Koh Hong Teng is currently one of Singapore's foremost comic artists. Having completed his diploma in Graphic Design at the Nanyang Academy of Fine Arts in 1993, and followed that with an honours degree in Graphic Design (Illustration) at The London Institute, Hong Teng worked as a graphic journalist for The New Paper for a couple of years, before creating and self publishing his debut comic book, 01321, in 1996. Between 1997-2002, Hong Teng worked as the design director at Patroids Creative Works, before leaving to concentrate solely on comics art and painting. He collaborated with writer Dave Chua to adapt his novel Gone Case into a 2 volume comic book of the same name in 2010-11, which was also recently adapted into a TV film. Last year saw him publish Ten Sticks and One Rice with Oh Yong Hwee from publishers Epigram Books- the book won the bronze prize at the International Manga awards last month. 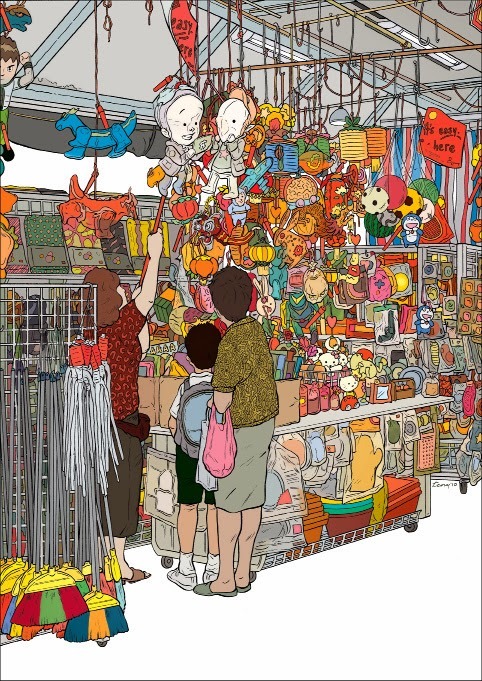 I first came across Koh Hong Teng's work after reading Ten Sticks and One Rice, his comic book collaboration with Oh Yong Hwee, on hawkers, the Triad, a rapidly changing Singapore, and a growing generational and cultural chasm between parents and children. To be perfectly frank, his work in there was accomplished and interesting (particularly when drawing the heavily wrinkled face of his protagonist), but it didn't grab me until I came across some of his illustrative spreads for an exhibition at the Mulan Gallery, which again focused on the preservation and highlighting of Singaporean facets such as buildings and architecture, cultural nuances, as they made way for the contemporary and new. 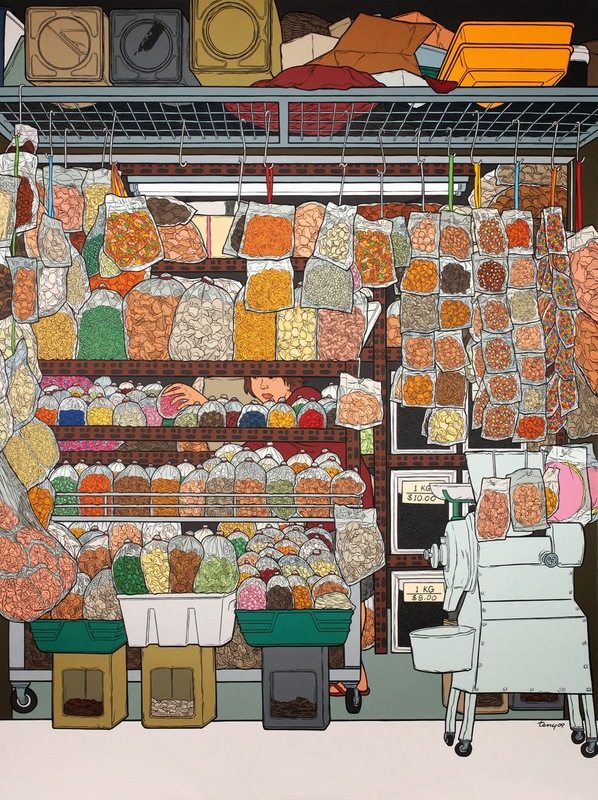 The colour really takes Hong Teng's work to another level: the detail, precision, and fine lined clarity instantly reminiscent of one of comics greatest artists: Geof Darrow. 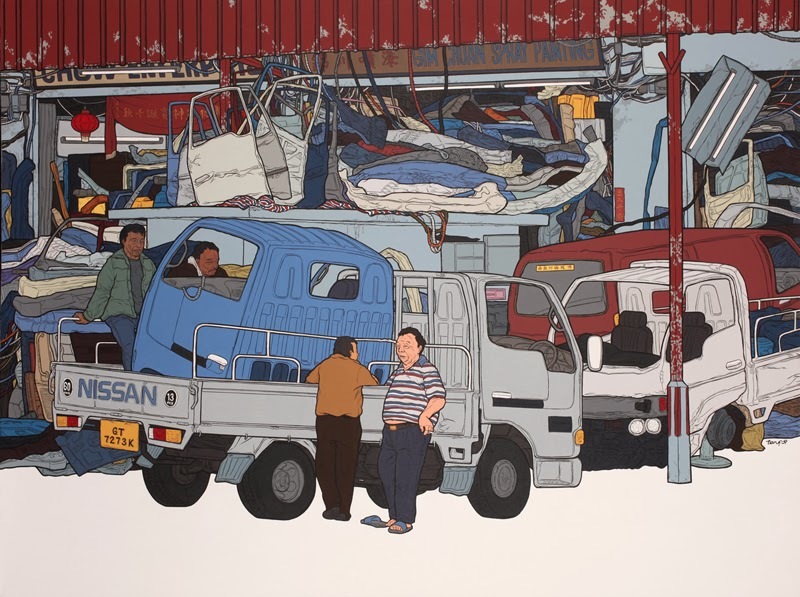 Yet Hong Teng's art is no mere imitator, there is something in his captured scenes, a nostalgia and stillness that is devoid of presentation, a very real and beautiful look, an insight, in both tone and aesthetic. I thought it would be a good idea to have a chat with Hong Teng, and hopefully introduce a few more people to his work. To open, with then, the obvious question: when and how did your interest in comics begin? Were they always something you read as a child, something you became involved in at a later stage, or perhaps the work of a particular artist that led you towards the medium? I started reading comics when I was around 5. 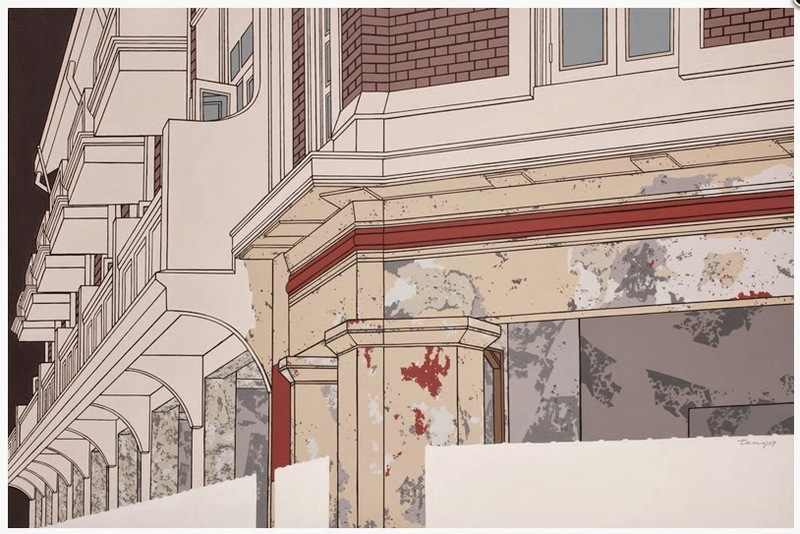 In 2012, I drew a short story for the Singapore Memory Project, which is commissioned by the National Library Board and I think you can find out how it began here. I continued to read martial arts comics right up to my secondary school days, and one of my favourite comics is 'Chinese Hero' by Hong Kong artist Ma Wing-shing. His art style has a large influence on my work. It was my older cousins who introduced me to comics. They would supply me with the latest issues of comics from Hong Kong when they came to visit my grandparents, who were living with my family on weekends. Oh I love Geof's gorgeous drawings. I first saw his work 'Hard Boiled' when I was attending art college in the early 90s, and yes, I'm greatly influence by his style too- I love drawing details and I can't name another artist who is as meticulous as Geoff. I still read comics but not as much as I used to... now that I have to spend most of my time on drawing comics instead. As for artist that really made an impression, it still has to be the late Moebius, he is so versatile that from Blueberry to Arzach, The Long Tomorrow to 40 Days Dans Le Desert, you may think that it's drawn by different artists. And Otomo is still the grand master of action/sci-fi genre. What else, apart from comics, do you draw influence from? Films. From genre with wide audience appeal to art house fairs, I think there are a lot of lessons that could be applied to comics. 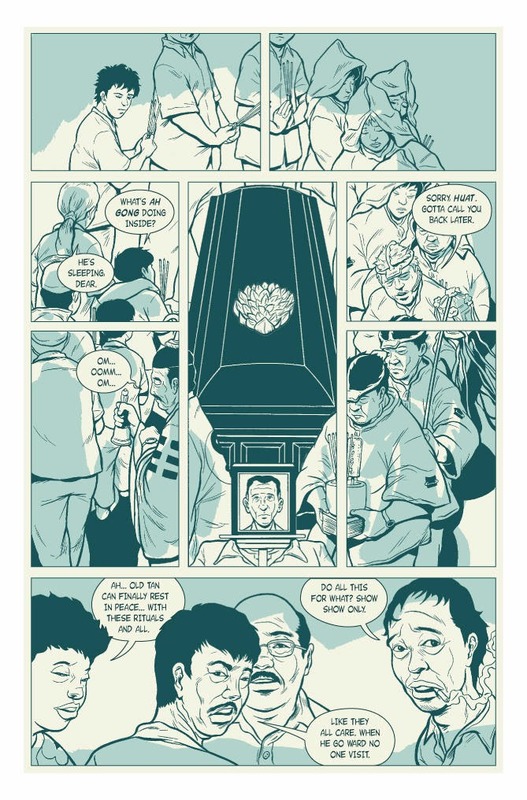 For example, in Ten Sticks and One Rice, in the scene where Hock Seng and Boon Shan were completing the 'rituals' as sworn brothers and you find Hock Seng kneeling in front of Boon Shan's coffin in the following scene- the characters were used as a bridging elements between two different sets of time and space. Congratulations on the International Manga award for Ten Sticks and One Rice. How did you become involved in that- I know Epigram were striking out and launching a comics line for the first time- was it a matter of being approached by them? Thank you. It still come as a surprise to me. It was a project initiated by Sonny, if I could recall. In 2011, after the publication of Liquid City 2, he was going around looking for potential publishers who would be keen to publish local comics. Then came the news that he was being contacted by Edmund Wee, creative and managing director of Epigram Books, who was looking for comics creators to launch 5 comics titles with the support from the Media Development Authority. That's how it came about. Ten Sticks and One Rice stuck an intense chord with me, particularly in its depiction of the generational/cultural disconnect between parents and children. It seemed Ten Sticks presented Neo Hock Seng more sympathetically than his children, the decisions he had to make. What was it about this story that you felt you had to tell it? Neo Hock Seng is loosely based on the writer, Oh Yong Hwee's father's life experience, which is also very similar to my father's experience. Both of them grew up in a Singapore which was underdeveloped, they were not very well educated, had to rely on hard labour to support the family and bring up their children, and suffering with cancer in their old age. I think that's the reason why I had to tell it. Ten Sticks was also pretty unique, I think, in that it presented older characters and their story, which we rarely get to see in comics. Why do you think the majority of comics focus on younger protagonists when the audience is actually varied in age? Well I didn't really think too much about the audience when creating Ten Sticks and One Rice, to be honest. I just feel that I should be telling stories that mean a lot to me, deep inside. There's also the presumption that comics are mostly read by younger people, and that's something that they feel connected to. How much does Singapore and its history, heritage and social issues influence your work - the books you've done so far are linked thematically in that they all address Singapore in some way. I believe you worked as a graphic journalist for a while- has that affected how you view things, and the subject matter you choose to convey? I think there are a lot of interesting stories waiting to be told and I'm very fortunate to have friends like Yong Hwee and Dave Chua who are able to write good stories about Singapore. My 2-year experience as a graphic journalist, as short as it may seemed, perhaps, allows me to search for little vignettes that I thought would be great to be turned into comics. It's obviously a different experience creating a comic wholly on your own , and collaborating with a writer. Do you prefer one over the other? Or is it a matter of utilising different skills for each, and having the combination of both experiences at hand? Collaboration definitely works better for me. Working alone as both writer and artist proofed to be very time consuming. I feel that drawing is my forte rather than writing, so I prefer to concentrate on drawing. I talked to Sonny Liew last year about the small, burgeoning comics scene in Singapore, although largely dominated by manga and US superhero comics, and he said one of the problems local comics faced was critical mass and the lack of numbers to support comics. How do you view the local comics scene? Is there anything you think could be done to improve and build it? 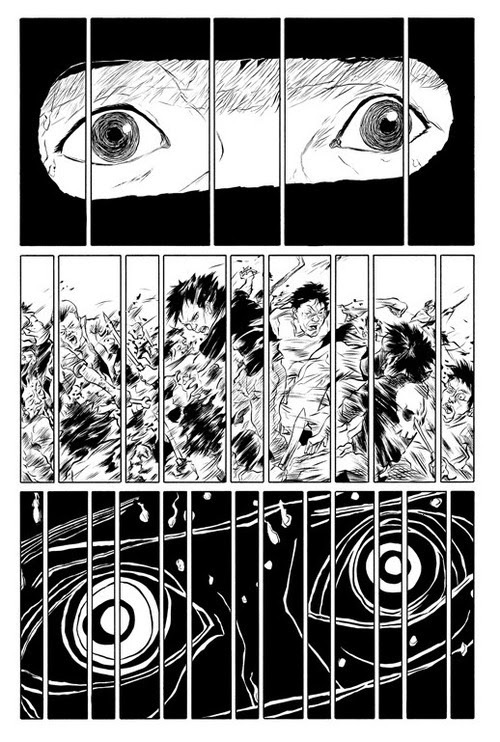 Who are the stand out Singaporean comics creators? Yes I agree with Sonny that one of the real issue is that we just don't have enough audience in Singapore to build up the mass required to sustain, not only comics creation, but other art forms as well. I think more could be done to inculcate the love for the comics medium especially to the younger readers. To let them grow up with not only foreign heroes, but also heroes they could identify with. As far as I know, artists who are creating comics on a regular basis are Sonny, Andrew Tan, Miel and Troy Chin. You have a background in graphic design- do you find that makes you approach your comics making in a different way? Does it enhance the understanding of specific elements? I was focusing more on illustrations when I was in my graphic design course, though it was mandatory to learn design principles and other disciplines such as advertising, typography and photography. On hindsight, I think it helps me to have a better grasp in the design and layout of the comic book that I'm drawing. Can you tell us about any upcoming comics you're working on? Currently, I'm quite busy with a good number of funded projects. Besides comics, there are art installation projects and painting commissions. I hope that I would have the opportunity to try out some experimentations in graphic narratives soon, to try to push the boundaries a bit. I'm wrapping up a story about the closure of Tanjong Pagar Railway Station after 79 years in operation (do check out this site for more information about the station) and at a development stage for a story in collaboration with Yong Hwee and Dave Chua. It is a story about a man who comes to Singapore at the turn of the 20th century from China, who is determined to grow the best rambutan in the country. Many thanks to Koh Hong Teng for his time.